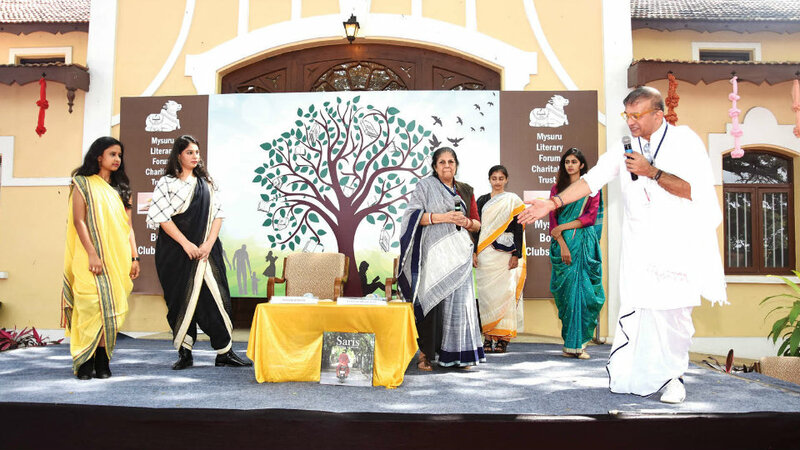 Mysuru: The Second Edition of the Mysuru Literature Festival drew to a close on Sunday with nearly 40 authors and experts in various fields sitting in discussion in two parallel sessions at two venues — Thangaali, the outdoor one with two beautiful rain trees as backdrop, where seven panel discussions were held and the indoor Angana where six panel discussions took place. 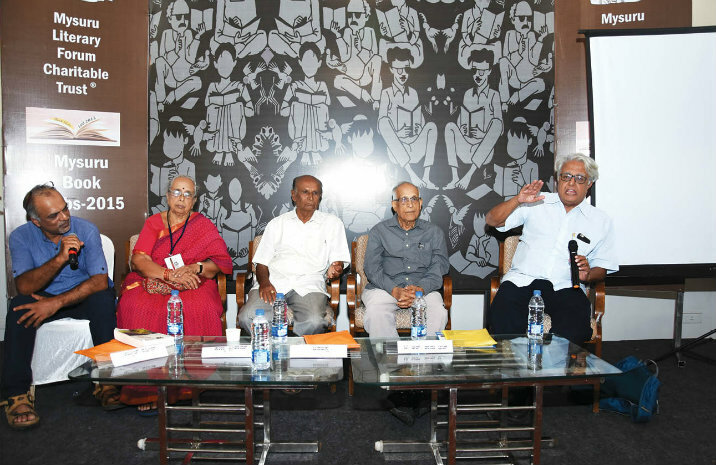 It was organised by Mysuru Literary Forum Charitable Trust and Mysuru Book Clubs 2015. After the inaugural session with the keynote address by former RBI Governor Dr. Y.V. Reddy, the panel discussions immediately began with Rta Kapur Chisthi, author-researcher-design developer and Fashion Guru Prasad Bidapa clad in an authentic flowing white khadi kurta and panche, holding forth on “Why we should wear the fabric of freedom?” a topic to mark the 150th birth anniversary of Mahatma Gandhi. Chishti called for sustained effort to promote khadi and other handloom products and said that one should plan for the next 50 years so that it will result in an action plan to benefit the weavers. Bidapa said that this can happen only when there is a direct contact between the weavers and buyers to promote khadi across the globe. He pointed out that with his own experience such a practice in Rajasthan has helped the weavers to increase their market. Bidapa, who is a stylist and has presented many shows highlighting the differences between synthetic and authentic khadi, said that while the former is poisonous to mother earth, the latter is biodegradable. Rta Kapur Chishti, who has penned a book ‘Saris of India’ presented a fashion show with the models in Khadi dresses, which drew the appreciation of the audience. 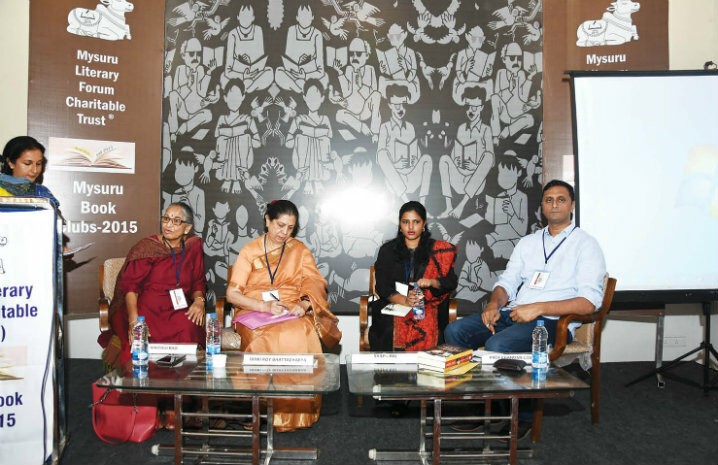 FROM LEFT: Maithili Rao, Rinki Roy Bhattacharya, Shilpa Raj and Prof. Chandan Gowda. Even as this session was going on in Thangaali, an equally interesting parallel session “Reminiscing behind closed doors” with authors Rinki Roy Bhattacharya, daughter of acclaimed film-maker Bimal Roy, our own city’s Maithili Rao, who has penned a book on actress Smita Patil titled ‘A Brief Incandescence’ and the youngest author in the festival Shilpa Raj, who has written a personal account of her life called “Elephant Chaser’s Daughter” enlivened the proceedings with Prof. Chandan Gowda of Azim Premji University moderating. While Rinki Roy spoke about the making of the film Madhumati by her father on which she has written and the efforts that has gone into making the film, Maithili Rao spoke about Smita Patil and how in her brief life she made a world of difference to Indian cinema. Shilpa Raj, whose story about how she came from a poor tribal family would have lost her life for female infanticide and how she was picked up by an NGO where she was educated and now is doing her M.Phil in Amity University, Noida, had the audience in tears even as she narrated her experience in impeccable English. Abdul Rashid (extreme left), Padma Shriram, Chikka Javarappa, T.R. Shama Bhat and Prof. Panini. This session in Kannada not only brought back memories of Mysuru’s own renowned Sociologist M.N. Srinivas whose seminal work “The Remembered Village” is still relevant but the most fascinating part of the session was the memories that Chikka Javarappa, the 81-year-old, brought alive that was the real story. Srinivas meets the then 11-year-old Javarappa, while the latter was doing the rounds of Kodagalli village near Mysuru in 1948. The young boy is depicted in this ethnographic study and the interesting part is when Javarappa asks Srinivas to talk to a woman who was popular in the village because she uses abusive language. He shared his experience of writing the book. Padma Shriram, a scholar, and related to Javarappa also interacted. Sociologist Prof. Panini, nephew of M.N. Srinivas also took part. The moderator in this session was All India Radio’s (AIR) Abdul Rashid who skilfully drew out the best from the panellists. The parallel session in Thangaali was titled “Figments of Imagination and Bold Canvases” where the panellists included Prof. Chandan Gowda, Dr. Mini Krishnan, Guru Prasad and Aroon Raman. Maithili Rao flanked by Mir Muneer and Mayur Puri (extreme right). The session on script writing in films and television titled “Making my Art my own,” even as the parallel session “Janapada Sahityadalli Hasya” with Alaka Kattemane in conversation with Prof. Krishne Gowda was going on at Thangaali. 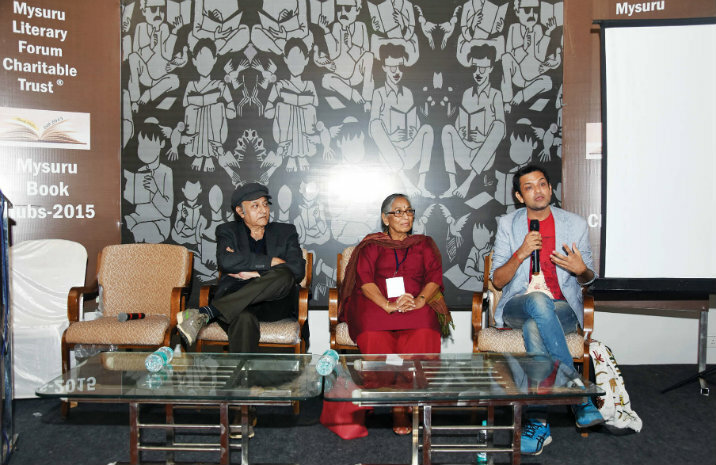 Coming back to script writing in films and television it was a very seasoned panel with two script writers both from Mumbai — the veteran Mir Muneer who writes scripts for televisions and the young and charming Mayur Puri who has written scripts for the likes of Shah Rukh Khan-acted films — who shared their experiences. With them was another veteran film journalist and author Maithili Rao moderating the show, which was a big takeaway of the festival. Maithili pointed out how the credit was not given to the makers of Madhumati an old film on reincarnation to which he replied that credit was indeed given. Then Mir Muneer revealed how the producers were only concerned about TRP ratings and how they had to stretch their serials because there was so much money involved even though they did not know anything about stories or scripts. Then Maithili Rao asked whether it was Salim-Javed the script writers who have written the blockbuster Sholay, the pioneers whose names appeared in credit titles of the films, Muneer pointed out that in Mughal-e-Azam there were four script writers who had all got their due. But the credit went to Salim-Javed because they gave 14 blockbuster films, said Mayur. The other successful script writer they said was Khader Khan.